Two blue lions with red outlines walk from right to left; each is set into a hexagonal shape defined by linked lozenges, which have partly deteriorated, but they were outlined prior to stitching. The lozenges are outlined in red and each contain two half-palmettes. The small lions have a long tail curving over the animals' backs and a raised front paw. This probably identifies them with Sultan Baybars who ruled 1260-1277. 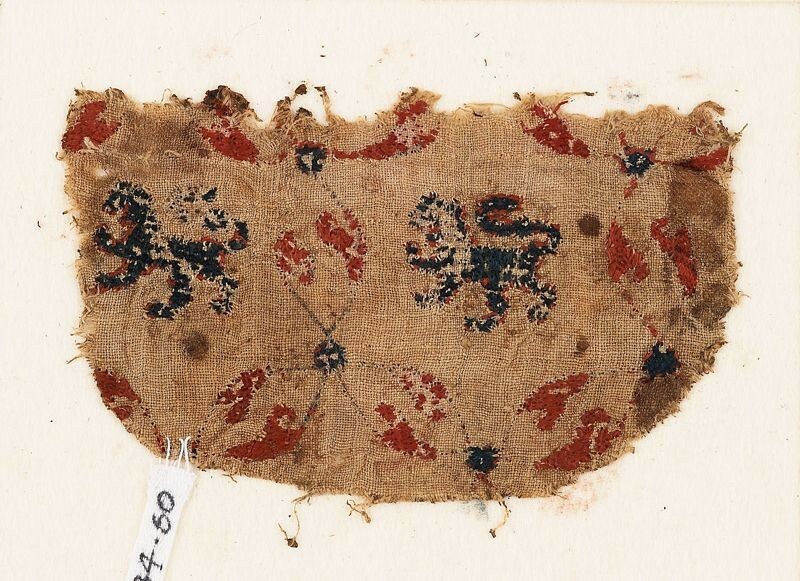 The fragment has the shape of a small pocket or lappet. Laid threads are couched down over surface satin filling stitches. There are remains of outlines, possibly worked in stem stitch.